Now I'm sure that for some of you, this is the way to go and you wouldn't think about trying it any other way, but for me... this is just strange. This is the first model that I've painted in pieces or sub-assemblies or whatever you want to call them. And I'm only doing it like this because I need to mail this monster to my client when it's done and I don't want it to break in the mail, (that's how it ended up like this). I have to be honest though, it has been nice to work on it like this and I'm probably going to do it again with any other big models I get to do. It does make it easier to get things painted and handling the model overall is a bit easier too. I have never tried painting a model in pieces at all, though I can see how it would be convenient on some models, esp. vehicles. I would try this, but never with an infantry model. I'm not that concerned with hidden bits on my infantry. ctreleheb: I know exactly what you mean, if I can't see it... it doesn't get painted. Saves lots of time. I ended up painting my Land raider in pieces as well, it made the whole job so much easier. I do it with any model that has partially obscured areas (mostly multi-part plastics) because I'm a bit of a perfectionist. If I don't, even if nobody else ever sees it, I'll know that the chest plate of those marines isn't fully painted, and it'll annoy me to no end. I hated knowing that my Cadians chest plates werent done, they're so wel sculted they deserve painting! SOoo Iv sold off almost everything done in that way now (old colour scheme anyway) and Iv started my latest models without the arms covering the body. Thing is, Im concerned as to how I'll hold those arm pieces when I want to paint them. I'd always painted a model in pieces, but now I'm trying paiting them in one piece, and I thought it was more difficult! At the end it's easier!! The problem with painting a model in pieces is IMO that you can't really get a feeling where light and shadow should be. It's nice to have a well painted cadian breastplate for example, but that can just look so wrong when there ought to be a dark shadow under that rifle. I always try to paint models fully assembled if possible. Sometimes that turns out very difficult of course. The only time I paint a model in pieces is if I need to paint the inside or some other moving part of the model. Normally I just have everything stuck together and get things going. I have seen some people use a pin vice to "hold" pieces while they paint them. That is, they drill a hole in the piece and leave it stuck on the drill bit. The Marine drop pod practically has to be assembled in pieces. With my Tyranids, I paint the big beasties now separate from their bases as it is very tough to get under those rib cages. The gribbly arms can also get in the way, but mine are all magnetized so I end up painting them in pieces anyway. I'll second Faolin's comment about the drop pod -- paint it in sub-assemblies if you value your sanity. 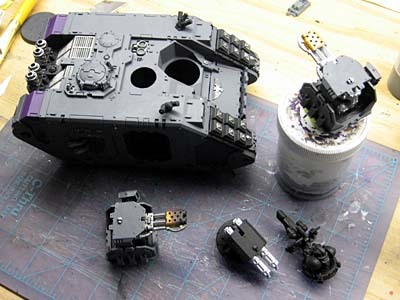 Like-wise that's what I'm doing with my Valkyrie (a must if you're painting the interior). I can see the value for vehicles, but I too had to put the pieces "together" to make sure it looked correct once assembeld with all the highlights and such. As for individual guys, sometimes I don't even paint the undersides of arms or legs. There used to be a joke with some of the guys in my club that you could tell which models were mine if you picked them up and looked at the underside... if there was bare plastic, there was a good chance it was mine. This is a really mixed bunch of comments. I used to assemble things 100% and then paint them, but now I do small assemblies because I think the end product is a little nicer. However, I'm finding that I'm starting to use a combination of both techniques. I'll do base coats and shading in assemblies. but then put the model together and do the highlights. I prfer to prime and base coat on the sprue. After that I assemble the core pieces and touch up the base coat. Then I add grenades extra guns odd details etc. Finally I wash and highlight/ drybrush. I could never stand the thought that just behind that gun arm was bare plastic. my process is typically sand and clip, wash, prime, paint base and colors, attach parts, wash, and shadow. I'm one of those guys that hates to find the part under the backpacks unprimed and unpainted. I want to pick up a model and see it's been done all over. not just stage makeup. but then again, I usually only prime and single color the insides of rhinos, maybe hit a drybrush of metal. "Stage makeup," I love it. It works great for bigger models. As well, I paint all infantry with their arms off and then put the arms on and paint them. Back packs as well. I am with Gothmog. I generally paint the main body + legs seperate from the arms for base coat and make drybrush ... atleast so I can get chest details painted. Then I glue them together and ink/wash/shade/etc with the complete model.